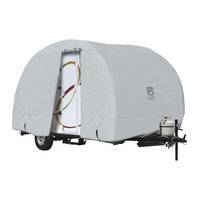 When you’re not using your R-Pod or Teardrop Trailer protect it with a weatherproof cover from Classic Accessories. 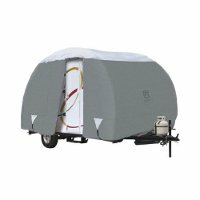 We offer R-Pod Covers and Teardrop Trailer Covers in PolyPRO 3 and PermaPRO. 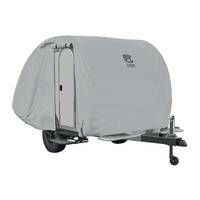 These all-weather covers will shield your trailer from the elements saving you on costly cosmetic repairs. Classic Accessories has been in business for over 30 years providing high-quality covers for various units. They know that it is important to provide efficient and attractive RV covers for your lifestyle. Classic accessories will not disappoint with the PermaPRO material, which is 100% woven polyester for exceptional water repellancy. 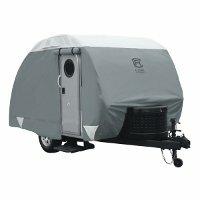 The sleek, cool, gray-toned cover provides a simple, appealing look for your RV.